This book will make you weep in the best way possible. 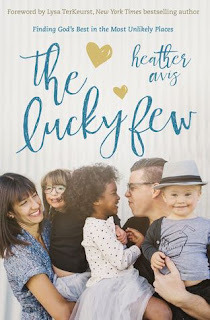 Maybe it's the season of life I'm in where I'm trying to figure out how this whole family thing is going to work or maybe like Heather, it's watching by the grace of God how he ordains every step and puts a family together. This book will make you want to say "Yes" to the right things in your life and to start saying "no" to the things you know aren't yours. It will make you stop pursuing dead ends even when you know they are selfish because you see the power of loving people well in this book. You see the power of Grace and you see the power of His perfect plan! If you are looking for a book that will make you smile, dream, cry, hug your family a little tighter and will show you the power of God, then this is your book! Don't walk away from one of the most unique and beautiful non-fiction human stories I have ever read! Thank you to the publishers for providing me a complimentary copy for review purposes. A positive review was not required, but you'll love this book afterwards! I give this book 5/5 stars! Q: What is the last book that made you weep? I haven't read a book that made me weep in a long while but I'll be certain to add this to my list of books to check into. Thank you! I want to read this book so bad! 5 months Apart made me cry, sad tears and happy tears. Thank you for this post!